Romney Shares Cookies, Primary-Day Forecast With News Media : It's All Politics Reporters aboard his charter plane asked Romney asked about his expectations for Tuesday's primaries in Alabama and Mississippi. He said if the polls "are anywhere near correct, we'll end up with, I don't know, a third of the delegates." And Romney, said if that's the case that "inches us closer to the magic number" of 1,144 delegates. 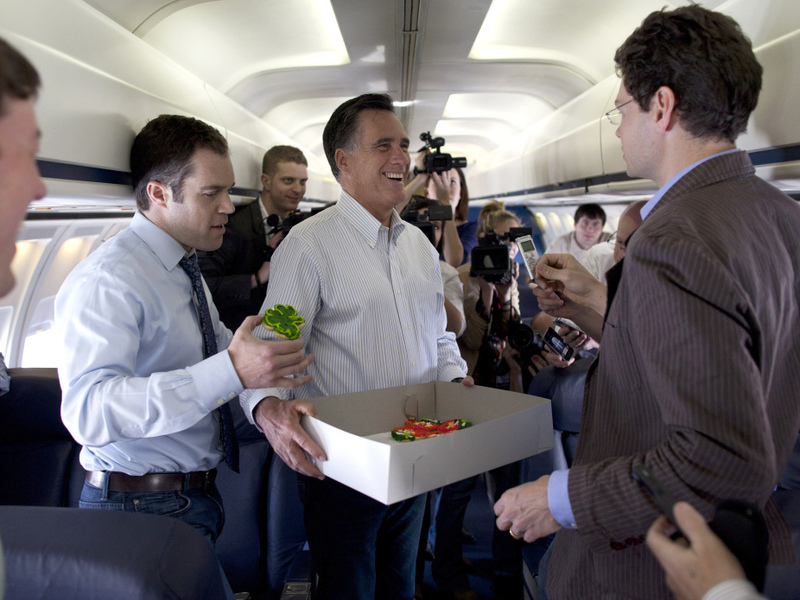 Mitt Romney chats with reporters as he hands out cookies aboard his charter plane, Tuesday, March 13, 2012. Mitt Romney walked to the back of his charter flight between St. Louis and Kansas City Tuesday bearing cookies and a few words for the press corps. In honor of St. Patrick's day Saturday, the cookies were decorated with leprechauns and shamrocks. Romney campaigned in Missouri which is holding caucuses through Saturday. Romney was asked about his expectations for Tuesday's primaries in Alabama and Mississippi. He said if the polls "are anywhere near correct, we'll end up with, I don't know, a third of the delegates." And Romney, said if that's the case that "inches us closer to the magic number" of 1,144 delegates. Romney, celebrated his birthday Monday campaigning in Alabama in advance of today's primary. He said campaigning was "not what I expected when I turned 65." He said he saw his wife, Ann only once, at a morning rally. "We gave each other a kiss and off we went." Asked by reporters about the best gift he received, Romney answered "a kiss from my wife. That was the only present I got."